They risked their lives to shelter displaced Jewish families under Italian, and later German, occupation during the Holocaust. Many in the small, predominantly Muslim country in southeastern Europe took refugees into their homes despite the risks and the cost, passing their guests off as family members to keep them safe. At the core of this effort was a concept called “besa,” an Albanian code of honor that holds a person’s oath as sacred. Under besa, a guest in one’s home must be protected at all cost. The code is uniquely Albanian and is cited in the new film as the main reason that Albanians opened their borders and their homes to displaced Jews when many others in Europe turned them away. The code is fueled in part by the tenets of Islam under which saving a life is a blessed act. Until recently, this chapter of history remained relatively unknown, hidden by the decades of isolation that Albania fell under following World War II. “Besa: The Promise,” which will be shown in different parts of the country in coming weeks, tells the story of Albanian rescues by focusing on the overlapping journeys of two very different men. The first is Norman Gershman, a Jewish-American photographer who for the last decade has photographed many of the Albanian Muslims who joined the effort to shelter Jews. 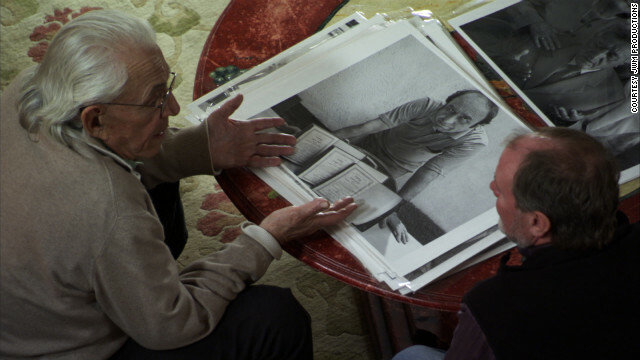 He has traveled to Albania to meet with them or their surviving family members, documenting their tales of heroism. The film’s second protagonist is an Albanian shopkeeper named Rexhep Hoxha, who was born after World War II but has struggled for decades to fulfill an oath that his now-deceased father swore in the 1940s. 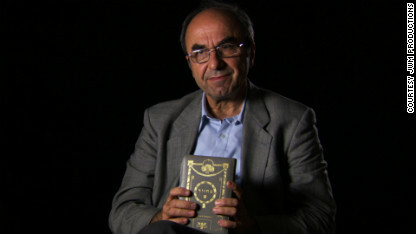 Rexhep Hoxha holds one of the Hebrew prayer books left behind by the Jewish family his Muslim father rescued in Albania during the Holocaust. Hoxha’s parents sheltered a Jewish family during the Holocaust. When members of that family fled to Israel, they left behind a set of religious books, which the Hoxhas promised would be returned to them one day. But Hoxha never saw them again. Albania is Europe’s only majority-Muslim country, and its Jewish population before the war was about 200 people. To some, those facts may make it even more surprising that Albania succeeded where the rest of Europe failed. According to Yad Vashem, the Israeli museum that holds the world’s largest repository of documents and information related to the Holocaust, there is not a single known case of a Jew being turned over to Nazi authorities in Albania during its occupation. Incredibly, Albania’s Jewish population actually grew during World War II. The reason so little is known about Albania’s unique role during the Holocaust has a lot to do with the country’s post-war history. Once the war was over, Albania fell under communist control and spent the next half-century behind the Iron Curtain. Families who risked everything to save lives in the 1940s are only now getting recognized for their contributions. Rachel Goslins, who directed the documentary, is as familiar as anyone with the history of the war. In her first short film, “Onderduiken,” she recounted her family’s ordeal hiding from the Nazis in the Netherlands. Yet Goslins said she was “gobsmacked” when she first heard about Gershman’s discoveries in Albania. “It just seemed like such an important piece of history,” Goslins said. She was even more amazed when she and her crew came across Hoxha. Hoxha’s quest to return the books that were placed under his father’s protection brings the story of what happened decades ago into recent times, illustrating how the principles of besa have endured. The film takes Goslins and her crew from Albania to Israel, charting Hoxha’s commitment to a promise he inherited from his father and his fear of passing it on to his son. Until he finds the family that his parents' sheltered during the war, he continues to carry a burden. For some in Albania, the recognition they’re starting to receive for their Holocaust heroics has come as a surprise. The concept of sacrifice is so deeply rooted in Albanian culture that many do not understand why they are considered unique. Time and time again, when Gershman visited the families of Albanians who had sheltered Jews during the Holocaust, he found people who were quick to downplay the significance of that act. Gershman said, “Anyone in need, if they knock on your door, you have an absolute obligation to save them, to take care of them, irrespective of if they’re friends, enemies, whatever." The makers of “Besa: The Promise” said they see the film as a lesson in interfaith cooperation. “Seeing Muslims as heroes, and seeing them as heroes to Jews, is not a particularly common story in our world,” Goslins said. That’s something she said she hopes she can change. Gershman takes the stories he heard in Albania to middle and high schools in the United States. He said he hopes to introduce the concept of besa to a new generation, thousands of miles from Albania. amazing.Looking out of the world. really outfit is just perfect. both of which we all need! Albanian Besa is a code of honor that has nothing to do with religions. We Albos are cool people and do not hate or support anyone because of religions. We do it more because of what we are. True and honest people, that what we are. No wonder we are so small and weak becuase we never try to harm people while these filthy neighbours of ours always killed us. Even today, if Jews need help, I will help because Jews are humans just like us. By the way, thank you Jews for helping us back in 1998-1999 Kosovo war. Albright anf Clark helped us too and they are Jews. http://www.AlbanianCircle.com is bringing together Albanians around the world to one circle. Create a profile, share photos, music, and videos. Be part of the largest, most exclusevily beautiful Albanian community in the world. I'm an Albanian as well and I am very happy that Albanians have saved Jews during world war 2. I think and believe that Jews have the right to live and exist in their homeland of Israel. Albanians back during world war 2 helped the Jew because we saw good people in them and also the victim of the war. Yes, we might have fought for Germany or Italy in Greece or Serbia but this does not mean we supported Germany in killing Jews. Besa has not much to do with religions. It is an Albanian code and affects only Albanians. Our neighbours like the Slavs and Greeks don't have this code. Being on their hand is like being on devils hand. No wonder Jews came to us and not to Greece or Yugoslavia. Long live Jews and long live the free world that respect any human being. I am albanian and I am proud to read this article. What I don't like about it is mentioning of Islamic in Besa. BESA has nothing to do with Islamic, just nothing. (I am a so-called albanian muslim). BESA is thousands of years old. There is an amazing legend about it. A guy returned back home his sister (who was married very far from home) 3 years after his death, to keep BESA to his mother. In Albania is the say; BESA can't be dissolved even by death. The fact that albanians protected jews during WWII is more than normal, natural, nothing special about it. I would like to mention that albanians protected italian solders too from germans and that's what I consider great generosity.The fashist talians occupied Albania from 1939 to1943, and after capitulation of fashism the nazis entered Albania, killing all italian solders that they found. On that situation many albanian families opened their doors for italian ex-solders, the people why some days ago killed their relatives, and protected them. The reason was that italians on that moment were not any more solders, but people on need, whose life was at great risk, people demanding BESA. Something else, albanians were all catholics and orthodoxs from the first days of Christianity. It was normal for them to switch from one to other depending on the politics between Roma and Constandinopoly. During the Ottoman times many albanians accepted to be named muslims for many reasons; escape many taxes, posibility for career etc. But in many families they continued to celebrate christian rites, kept 2 names; one muslim – the formal one and one christian in family, or in one family one son had christian name the others muslim (in majority the names were more turkish than muslim religios), or in one family one brother was muslim the other one christian, and they lived all in the same home. The religions issue in Albania is very special, and totally unimportant. Albanians can debate for everything, but never religion. Meanwhile, 50 million Chinese were murdered in the 1950's, 53 million Russian peasants in the 1930's, 5 million or so Cambodians by the Kymer Rouge in the 1970's, 800,000 Rwandans in the 1990's. Yet we rarely hear about them. But at least one story a day appears in the regular media about the Holocaust.